I had owned this house for 8 years and threatened to get some chickens for most of those years, as I eat 21 eggs a week. (yes I need a cholesterol test). My grandchildren came out in January 2010 for a weekend and said, "Grandma, you said you were going to get some chickens." So I went to the feed store, inquired on when chickens would be in, and started setting aside some money for the chicks and their necessities. 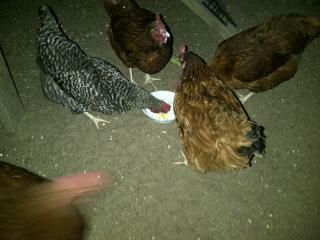 On March 2nd we bought 5 production red and 5 bard rock pullets from the feed store. They lived in a box in the kitchen with a warming desk lamp over hardware cloth over the box, and lots of newspaper. It was cold out. My house cats found the pullets fascinating. So did my big house dogs, but there were no casualties. 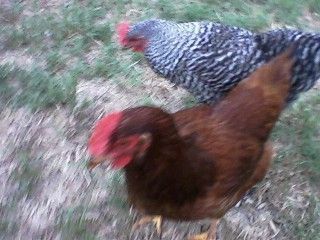 On March 6th my grandkids came out, and the chicks, now pecking each other on the head with boredom, got to go outside. My mini dachshund grabbed a chick from my granddaughter's hand and it died. Amazingly enough, I, a 5 year old and a 9 year old got the initial run up, with a roof (no pic after the roof went on) in 2 days. On March 13th we bought enough wood to fill in the blanks since I had a lot of wood left over from other projects laying around my garage and shed. I was determined to use it all first. And a bale of straw. The pullets were outgrowing their box, and would have to move outdoors soon. On March 17th we bought the lumber for the chicken house large enough to theoretically hold all of the chickens. Note the stepladder in this march 24th pic. I think that is how the cat (or something that could climb) got in a couple of days later to kill & eat a chick inside the pen during the night. Ladder moved, extra chicken-wire added high up the same day I found the body. It's trial and error around here, with limited time and budget. On April 8 the kids came back out, and my grandson loaded 6 more 2x2's in the back of the truck. Then my neighbor's kids came over to play and work pretty well ceased. Today is April 18th, and the kids aren't here to help, but I MIGHT get the chicken house part way assembled. I'm off work. That's a plus. It's raining. That's a minus. But I figured I'd post some pics now that I learned I have a chicken page. My lady birds already spent the morning sampling tasty rainy yard weeds. I penned them up with fresh food and water, but here they are begging me to open the pen so they can forage some more. Hope to get their big house built soon. May 10th pics - house just needs a roof and nestbox dividers. Chickenwire and slats replaced by a thin piece of plywood - over a 2x4 support brace. Still has slits, one to each side, for water to sluice out during cleaning. worked pretty well when I cleaned the wood before painting. 45 mil epdm rubber will be the floor except during cleaning, flipped up a bit at the edges to protect the wall/floor seam from gunk. Have to figure out how to hang my perches from the front side, as the whole front will be divided into 2 big doors for easy cleaning. I tested my reach today, this is not going to be tough to manage, and the height makes it very easy. 2 ft supporting legs, front to back brace is about the right height for chicken perches, so the birds tell me. The house got a pond liner floor and a perch before I rushed out to work this spring. The hens used the perch for awhile, but as the weather got warmer, one of the bard rocks preferred the roof, all 4 production reds preferred the old brooder top - not a good perch there, and far too close to the back chicken wire wall with the shed. The dogs protected them til I could get it rearranged, didn't lose any chickens. July is here. One of my helpers came out just before memorial day weekend and helped me add the very heavy 2x4 fencing, 5 ft tall, around the run. Couldn't get it between the shed and the roofed part of the run, but nothing very big will fit there either. The roof was actually finished with wood, I'd had one side done, one side pond-liner til I could get help, and the run screen door got installed. The interior hasn't changed much, except for the addition of a perch back in the winter, and a piece of 45 mil epdm pond liner on the floor to catch the droppings. 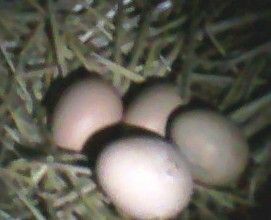 I added the nest-box divider 2 days ago, after finding my first eggs in the box. New pics to get the page current. All birds are healthy, and I guess they are all hens. Getting 2 eggs a day it would seem, as of Saturday July 3rd. Original roofed run: 4 ft by 8 ft, 6 ft high at front, tin pieces were 11 ft long, I didn't cut them, just centered over roof frame. Add on run - 8 ft by 8 ft, 6 ft high, dug in 4x4 post to support center top beam. 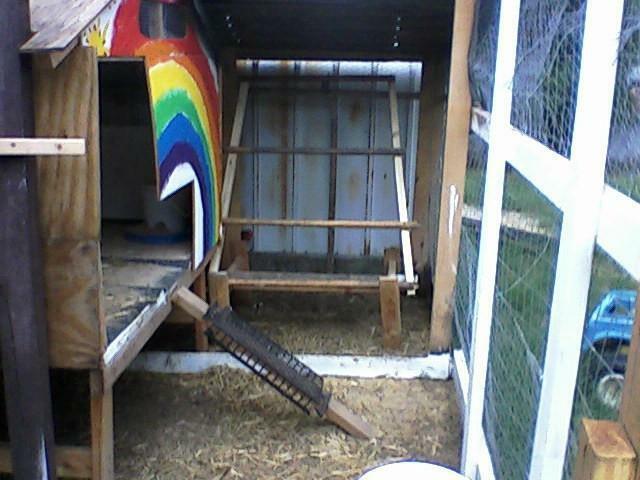 Giving a run area of 8 ft by 12 ft.
Hen House - 2 ft off ground, 4 ft by 5 ft, 3 ft high at eaves, 4 ft high at peak, built of 3/8" plywood to keep the weight down. Plus 2 add-on nest boxes 18 inches x 12 inches. The house had to be built within the space between the original roofed run and the 4x4. 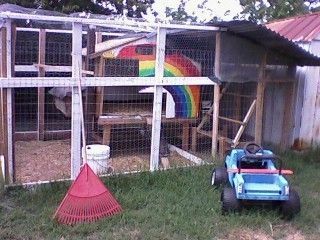 I actually had a plan but it was cluttered, messy and the chickens prefer open navigable space. I prefer it too, much easier to clean. Hen house floor is 1 1/4 inch sub-flooring, a 4ft piece cut in half, with 1 ft of thin plywood over 2x 4 in the center, and a slit around 3/4 inch to either side of that plywood, if I ever have to mop it out it will drain nicely. The sub-flooring is very strong, so additional lower framing was optional. I painted the whole interior with Kilz2 latex to seal off the wood. One 2x2 perch runs from side to side - 5 ft long, Starts just above the nest box cut out. Windows are as large as I could manage. I will have to cover east and west during the winter, they are 8 inches high and about 3 ft long, covered with 1/2 inch hardware cloth that mounts on the inside. Put together with screws I have been assured will go brittle and break, but they haven't yet. Front of hen house was supposed to open on hinges. I hung one side with screws so I could position my hinges, then ran out of daylight. The other side will be hinged, I've found I don't need that much space to lean in and pull the pond liner floor up for cleaning. Not using deep bed method - would make more work than an easy tidy up twice a week. Poles for the new perch - shovel handles and tamper handles from tools that gave their all. Screwed into 2x2's - with an added 1x2 horizontal at the bottom. 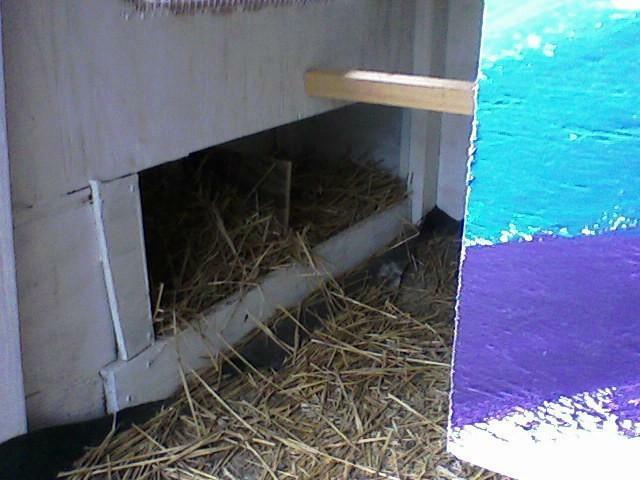 The base of the old brooder elevates it. I think either a change in Layena's formula, or the heat, is giving them a calcium deficiency. So a yogurt treat this evening was well received, crumbled eggshell and banana (peeled of course) hidden in the yogurt. Getting about 2 eggs a day, would really like 3, but the heat has surely taken a toll. November 18, 2011. I have 5 americauna pullets in the greenhouse. 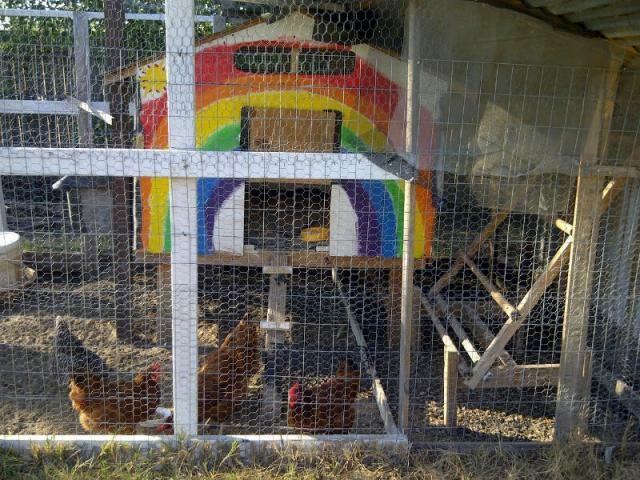 And if I ever have to leave town, I need to move all laying hens to my empty corner lot. It's fenced, no dogs, will have bees again. I need to build a lightweight tractor that I can stake down, flat chickenwire with stone around it, chickenwire roof, that I can move around at that lot and let them dig up the weed grasses, and let a neighbor or friend collect eggs while I'm out of town, etc. I didn't plan on traveling when I set up this coop. Ideas? Please post and pm me a post-link. Thank you. "Great example of perfect ventilation"
This coop excels in its use of ventilation. The coop has plenty of spaces for cross air flow. One thing that I would improve would be the choice of fencing material. Instead of chicken wire, I would suggest using hardware cloth because most determined predators can easily tear through chicken wire.